"You are a guest of the count, one of your allies and the strongest man in the region. Your sojourn has been pleasant, a nice change after weeks of battle. Suddenly the courtyard below your window is filled with the noise of galloping horses. More guests? You yawn as you look out. But these people arriving look more like tax collectors than guests. You decide to give your attention to something more interesting, like dinner. Relax while you can, friend, because these new arrivals are about to lead you to a crimson sailor, a cozy Tower of Terror, and a river with an aching heart. " 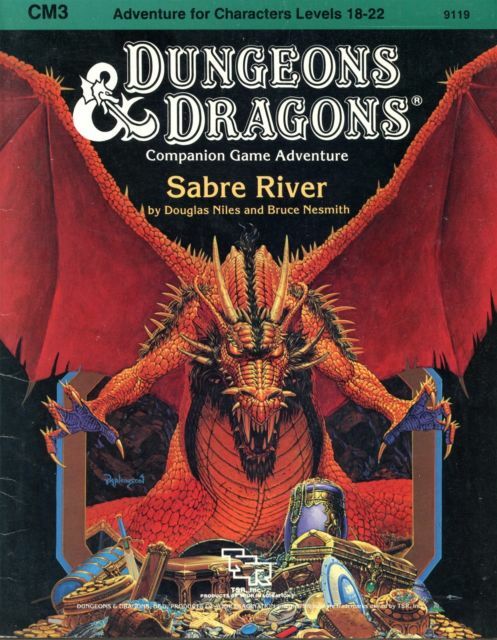 CM3 Sabre River by Doug Niles and Bruce Nesmith, CM3 involves an expedition to the Tower of Terror and an adventure romp through an active volcano! Well its game day again in the Northwest corner of Connecticut & I'm being buried under sewing machine repairs. But I've taken a bit of time to dig out one of the more criminally underrated. This is a high level companion adventure & one where the PC's are literally pulled from court into an active dungeon crawl adventure. This is a massive high level romp through the back end of Greyhawk or Mystara. The Crones of Crystykk who appeared in Test of the Warlords are back and just as bat %@% cryptic and weird as ever. Every thing about this adventure screams high level and very dangerous, have a few extra character sheets standing by for your players. Lots of treasure but also lots of classic OD&D death to go around. The Crones of Crystykk have me thinking about Clark Ashton Smith's Averoigne stories especially the witches of the Mother of Toads (1934). Now the last time I wrote about CM3 was way back in Feburary of 2016. Whoa has it been that long?! "Kit Navarro's Extended Northman Pantheon references them, the Italian MMB members have a Norwold timeline that mentions the Crones and a possible origin, and- going along with that- Marco Dalmonte has a list of Immortals Actively Worshipped in the North that includes the crones as a mystic Triad of Skulk clerics." Why is this important to Clark Ashton Smith's Averoigne stories ? We know that there's an Arthurian connection because of Averoigne's placement in France. Clark Ashton Smith's Averoigne is part of a " region in France, heavily forested — located somewhere between Tours and Moulins; a "main highway" between those two cities goes through it (The End of the Story, Clark Ashton Smith)." This means that there may be a deep connection between the Morgause's witches blood line & the Le Fey's . All of which ties into both The Crones of Crystykk & Sephora The Enchantress of Sylaire By CAS. Arthur had appeared in both Mystara & Greyhawk his mythology following him like a thunderclap as the hero king journeyed. His & Merlin's foot prints having appeared in the Realms themselves ala the Dungeons & Dragons cartoon. These witch families held or hold lots of sway over both royals & commoners alike. This is one of the central themes that we see in Shakespeare & Arthurian mythology over & over again. These bringers of chaos & guardians of fates roles in the planes should not be underestimated by dungeon masters or players. We know that there is a long tradition of studying magick & occult practices throughout the Le Fey family's holdings; "Middle English writer Thomas Malory follows the mostly Post-Vulgate French portrayals of Morgan in his late-15th-century seminal work of the selective compilation book Le Morte d'Arthur (The Death of Arthur), though he reduces her in role and detail of characterisation, in particular either removing or limiting her traditions of healing and prophecy, and making her more consistently and inherently evil just as he makes Merlin more good. He also diminishes Morgan's conflict with Guinevere, as there is no motif of Guiomar and Accolon (there Sir Accolon of Gaul) is her first named lover, but does not clarify Morgan's motivations for her antagonistic behaviour against Arthur. Malory scholar Elizabeth Sklar described Morgan's character here as "an essentially sociopathic personality, respecting no boundaries and acknowledging no rules save those dictated by her own ambitions, envy, and lust." Up until the war between Arthur and Lancelot and the rebellion of Mordred, it is Morgan who remains the main and constant source of direct and indirect threat to the realm. As noted by Mary Lynn Saul: "Curiously, in spite of all her powers, Morgan is rarely successful in any of her plots. Nevertheless, she remains a medieval symbol of the potential danger of uncontrolled female power. "In Malory's backstory, she has studied astrology as well as nigremancie (which might actually mean black magic in general rather than "necromancy") in the nunnery where she was raised, before being married to Urien (Uriens) as a young teenager; in this narrative she did not study with Merlin. Her powers seem to be inspired by fairy magic of Celtic folklore rather than by medieval Christian demonology. Malory mentions Arthur's attempts to conquer at least one of her castles, which originally had been his own gift to her, and which he could not retake (apparently due to magical defenses). She also plots an elaborate ambush in "The Book of Sir Tristram de Lyons", after learning of the death of one of her favourites in a tournament, but Tristan ends up killing or routing thirty of her knights when the ambush ends in a disaster. Morgan is widely feared and hated, so much that "many knights wished her burnt." She is now the leader of the four (not three) witch queens who capture Lancelot (the others being the Queen of the Northgales, the Queen of Eastland, and the Queen of the Outer Isles). 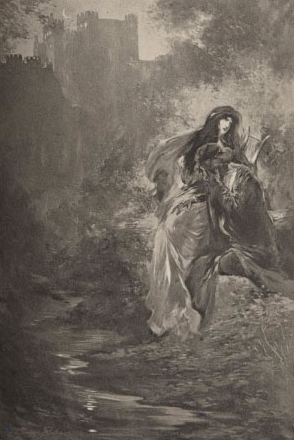 In an episode that had been first introduced by the anonymous writer of the earlier Prose Lancelot, Lancelot rescues Elaine of Corbenic from being trapped in an enchanted boiling bath by Morgan and the Queen of the Northgales, both envious of Elaine's great beauty (echoing Circe's treatment of Scylla). 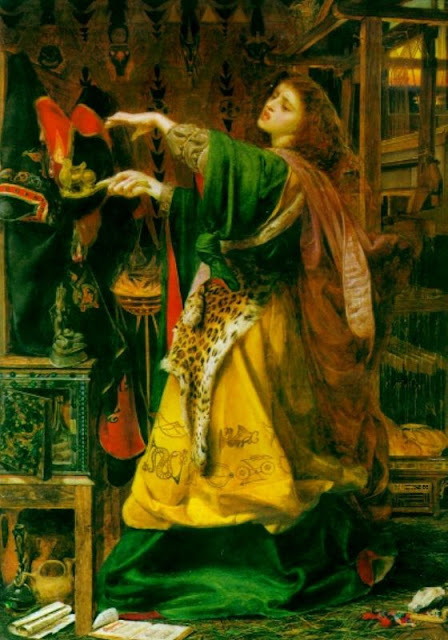 However, despite all of their prior hostility towards each other and her numerous designs directed against Arthur personally (and his own promise to get a terrible revenge on her as long as he lives), Malory's Morgan is still redeemed and is one of the four grieving enchantress queens (the others being Nimue, marking the end of conflict between her and Morgan, and two of Morgan's allies, the Queen of the Northgales and the Queen of the Wasteland) who arrive in a black boat to transport the wounded king to Avalon in the end. Unlike in the French and earlier stories on which Le Morte d'Arthur is based, and where Morgan and Arthur would either have first made peace or have just never fought to begin with, here her change of attitude towards him is sudden and unexplained. Arthur is last seen in Morgan's lap, with her lament of sorrow referring to him as her "dear brother" (dere brothir), as they disappear from the work's narrative together"
We know that there have been more then one Morgan Le Fey queens along with the more then one Morgause over the centuries. Each of these has been involved with the realm of the Fey. All of this up points the fact that wherever a member of Arthur's court is & one of these fairy witches sheer chaos follows. This is a perfect opportunity to grab & use Troll Lords The Codex Celtarum to help flesh some of this out. What does all of this have to do with CM3 Sabre River by Doug Niles and Bruce Nesmith? Quite a bit as the PC's are involved in an extraordinary quest that determines the fate of Mystara's Northwold. Here the agents of fate move both chaos & Heaven to get the dark fate of the world into their chosen ones hands. The level of PC execution within events gives the module its pulpy feel but its very possible to tie in the fates of those involved with CM3 Sabre River by Doug Niles and Bruce Nesmith in with other worlds & possible campaigns. I've got more thoughts on how this all comes down into the backdrop of a home campaign & how the echoes from events in both Mystara & Greyhawk can have far more reaching effects then what at first they might seem coming up. So stay tuned!